With adorable, whimsical illustrations, Cash Kat tells of a girl named Kat and her fun-loving grandmother who go to the park to help clean it up. While there, Kat finds coins and a dollar. Her grandmother makes Kat a new hat each time a piece of money is found. She also explains to Kat what the money value of each piece is. Kat eventually finds enough money to purchase ice cream, but sees a donation jar at the park to help with a beautification project. Kat makes an important decision that the park is more important than ice cream and donates her newly found money. In the end, Kat's wish is granted anyway in the form of a coupon with the face value of a free ice cream. This book doesn't take long to read but it packs a good amount of lessons and information. 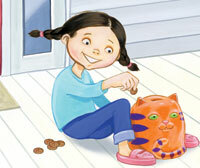 While reading, children can learn what coins look like and their monetary value. There's even visuals that show how the sum of coins can equal up to others. Kat and her grandmother are picking up trash at the park while they find the coins, which can lead to discussion on why it's important to keep our parks clean and pretty. Another value told in the story is that of generosity. The "For Creative Minds" section in the back of the book has a lot of facts about money, including which president is on what coins and the decimal place value of money. In addition, there's a Counting Coins game where kids can match the groups of coins on the left to their values on the right. To top it off, there's also a topic on litter. Cash Kat is a Spring 2016 book release by Arbordale Publishing. 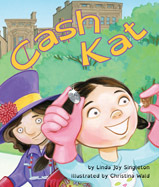 One person will win a book copy of Cash Kat. I'd like Astro: The Steller Sea Lion. A Cool Summer Tail looks like a good book. Anybody Home? looks like a fun book. I also like the ABC Safari book. My little chicks would like to read One Wolf Howls. I would like fur and feathers. I like this book for we are trying to teach my so about Money which is hard for him. I think this book would be neat to help him learn. I also like the book Shark & Dolphins book. we also Like Hunriest Mouth in the Sea for children by Arbordale! Anybody Home? does look like a very cute book to have. There are a lot to choose from. Once Upon an Elephant looks like a good book! i am also interested in In My Backyard. I think the book Mammals looks great! My Kindergarten students love learning about animals! I love the mammals book. This looks like a nice book. I thank you for the nice idea. I like their Animal Helpers: Sanctuaries...and all their animal books. Children should learn as much about the well-being of animals as they can! I like Mammals: A Compare and Contrast Book. I think my nephew would adore it.